The Alpine School District (ASD) Foundation honored three exceptional donors at a dinner on Tuesday, March 19. The dinner was held at Lone Peak High School in American Fork, catered by the high school students in the Culinary Arts Program, directed by Amber Baines of Lehi, and included students from Lehi High School. The Alpine School District Foundation’s mission, according to their website, is to “provide resources that will enhance educational opportunities for the students.” The foundation is the non-profit fundraising arm of ASD which funds programs for students in the district; the STARS Summer Reading Program for kids in kindergarten and first grade who are struggling with reading, the Gym Shoes Program providing new shoes for kids in need, scholarships, rewarding deserving teachers in ASD, and the SIMS program for sixth grade students who need help with math before they start junior high. The ASD Foundation receives donations which are distributed to the greatest needs for students. 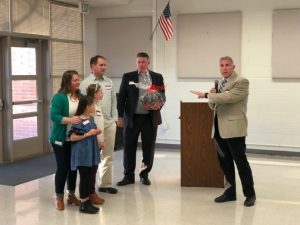 Foundation Board President Kevin Driggs shared with donors that the two biggest projects going on in the Alpine School District right now are improvements to Clear Creek Camp and the overhaul of the Space Center facility at Central Elementary in Pleasant Grove, with the addition of a planetarium at the Space Center. “All of you are here as donors because you did something special. You made a donation and you have a story. Every donation counts, every donation makes a difference,” said Tim Eisenhart, ASD Foundation Director. Eisenhart recognized the Edward St. John Foundation for their incredible $1 million donation to the Christa McAuliffe Space Center. 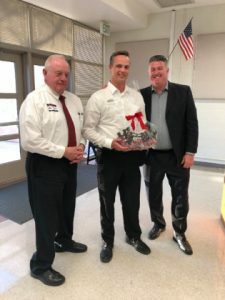 Vern and Dusty Pyne from Chick-fil-a were honored for their Spirit Nights, as well as the many other school events to which they contribute. “They get involved in every one of our schools!” said Eisenhart. The final honorees of the night were the Canen family of Lehi, the creators of the fundraiser “Sundae Monday.” In 2018, the Canen family raised $27,000 with their event and donated it to the teachers at North Point Elementary. The ASD Foundation gifted the picture book What Do You Do with an Idea by Kobi Yamada and illustrated by Mae Besom to all the donors who attended the dinner.